Peer-to-peer networking is a server-less networking technology allowing several network devices to share resources and communicate directly with each other. Pontem applications can be run on a peer-to-peer network. Host PC is NEVER turned off; logging off is okay. Host PC is more capable than client PC i.e., Host PC has more memory, dual-core processor, and large hard drive space. Use hard-wired network cables rather than wireless connections between PCs. Wireless connections can result in slow performance. Host PC must have a login account created; PC cannot go straight to the desktop when booted. This is required to facilitate Sharing capabilities. 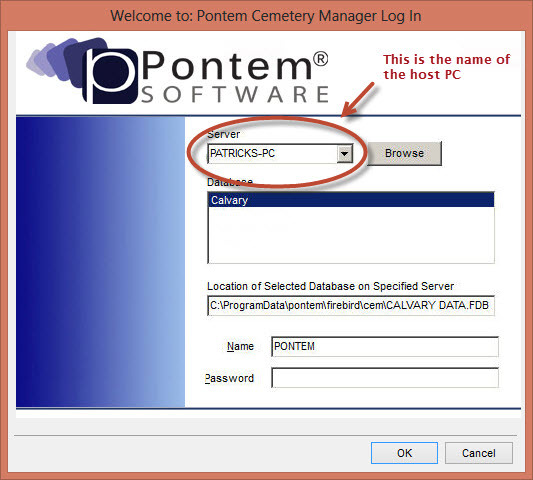 FBGUARD and FBSERVER, services used by Pontem, must be allowed through the host’s firewall. If the host PC is shut down, you must start it before you start the client PC. If the host PC is not powered on first, then the database file will not be visible. Once the host PC is booted you must enter its ‘Computer Name’ in the ‘Server’ field of the client PC's login window.